Cycling cities! Perhaps a few years ago, this would have brought to mind the compact streets of Amsterdam ideally suited for the biking fever it is renowned for. More recently this may have stretched to cities like London where bicycle banks dotted round the city with plentiful supplies of “Boris bikes” nicknamed after the mayor Boris Johnson who introduced them are the latest craze, or maybe even Singapore where the government is set to spend 43 million Singapore dollars on cycling paths. But, Colombo? 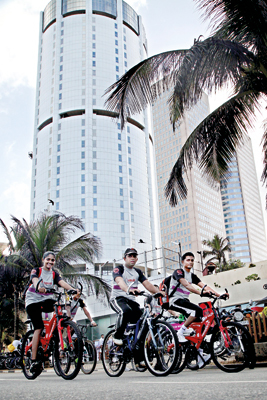 For the bystander on the Galle Road in the early hours of July 27, this would certainly have seemed like a possibility, as around 50 or 60 cycling enthusiasts gathered outside the Galadari Hotel for the start of Colombo’s first ever ‘Bike To Work Day’. The event, organised by Wroom, a group who describe themselves as ‘crazy fans of biking’ was sponsored by Canon and partnered by the Galadari Hotel, E-FM radio and MAS Group and gathered a whirlwind of support and positive responses in spite of the fact that planning only really began two to three weeks ago. One only has to look at the Facebook event page and see the hourly increase in likes, as well as the numerous suggestions from fans about how to make the day a greater success, to realise that it is primarily excitement about the cause, not exhaustive publicity that has catapulted the event forward. For Wroom, an initiative dedicated to popularising cycling in Sri Lanka, it is for the sheer joy of it as well as for health benefits and moreover to “energise Sri Lanka and get it to breathe fresh air”. Wroom recognises that Colombo is in the midst of a journey of change which they want to be a part of and help to maintain. 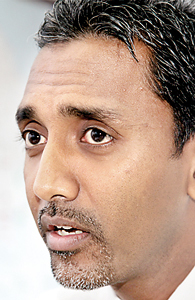 Yasas Hewage, the creator of the concept behind Wroom says that the enthusiasts at Wroom “primarily love what is happening in Colombo, but we want it to be like that in years to come and ensure that Colombo has “air to breathe”. Cycling provides a feasible way of making sure that this is a reality, offering a sustainable and practical transport alternative for city residents. The idea of Colombo as a biking city is, of course, relatively new and Wroom is all too aware of this, but they insist “it is possible although lots has to be put in place and we are trying to make this change.” Whilst it may be easier to thrust responsibility into the hands of the authorities, for Wroom their efforts are three-fold. On the one hand the public sector has much to do in terms of building the correct infrastructure, but equally Wroom suggests that the private sector could “wake up” and put in simple measures like showers in offices in place to make cycling to work a real possibility. 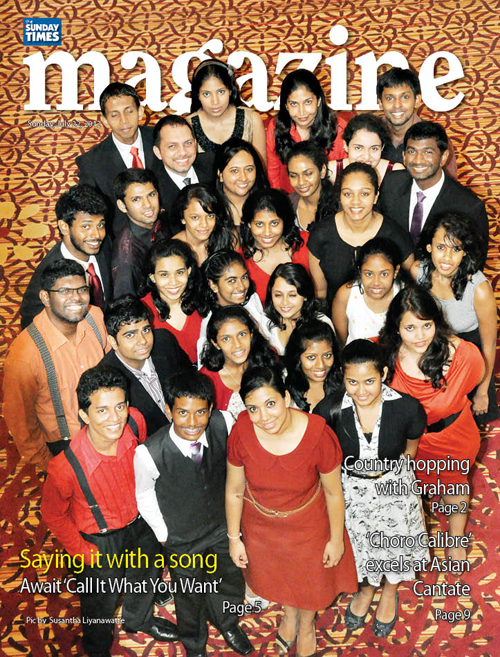 For some, efforts made by Wroom to encourage a new race of Colombo cycling enthusiasts have made an instant impression. “Some are getting into biking after 40 years and they love it, you see their inner kid coming out,” one enthusiast said. Cycling is clearly not for everyone, which is why Bike to Work Day was as much about doing whatever was possible to reduce your impact on the environment. Thus, car pooling, jogging, and commuting on public transport were also encouraged and the buzz created on the Facebook event page is a testimony to just how many people are keen to accommodate a more sustainable way of living. 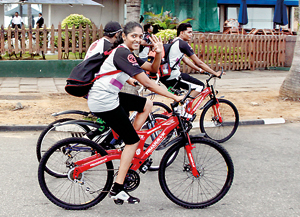 Colombo’s first ever ‘Bike To Work Day’ on the go. Those involved with Wroom and other cycling groups such as Strategy and Pedal Pushers truly believe that cycling is limitless. Volunteers and members of Strategy, Medhavi Jayaratne and Sajin Alles see cycling as “killing two birds with one stone- making Colombo a greener city and benefiting your health”, whilst for Yasas it represents the 5 F’s- fun, fitness, friends, family and future. To find out more about creating what one cyclist, Chandana Aluthgana described as “a healthy, new chapter in Sri Lanka”, visit www.wroom.lk.“Live-ride-enjoy”.